This is a Personally taken Colour 10" x 8" Photo whilst Barcelona were over in the UK and Signed In Person at a later date. Miguel Ángel Nadal Homar born 28 July 1966) is a Spanish retired footballer. Nicknamed The Beast, he based his game in a tremendous physical display, also being adaptable to various defender and midfielder positions. He began and ended his career with Mallorca, but his greatest achievements came whilst at Barcelona during the so-called Dream Team era. 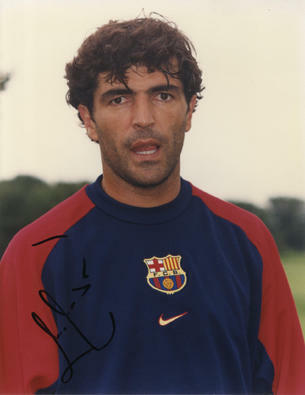 During 19 professional seasons, he played in 492 matches (462 of those in La Liga). A very important part of Spain's setup during the 1990s, Nadal represented the nation in three World Cups and at Euro 1996. In 2007, The Times placed him at number 47 in their list of the 50 hardest footballers in history.